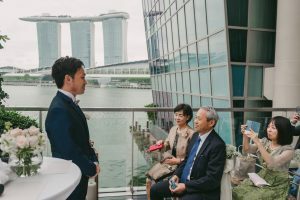 Destination weddings in Singapore for Japanese are gaining popularity in the recent years, and one of the common reasons is that they really admire the cityscape and the modern architecture here that can rarely be found in Japan. 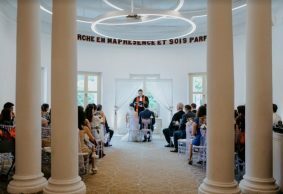 Most of the time, it is also because the bride or the groom is based here for work for a couple of years for work, and they would make use of the chance to hold their wedding ceremony here. As such, these destination weddings are usually relatively small-scaled, ranging from 5 persons to 50 persons. 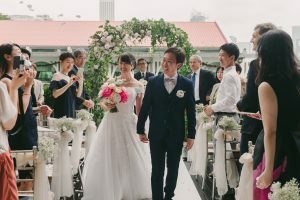 Yes, a 5 person wedding is perfectly normal for Japanese as Japanese families are much smaller as compared to Singaporeans 🙂 Even in Japan, most weddings expect only around 50-60 guests. We would recommend to start planning your destination wedding at least 6 months in advance, mainly to secure the venue of your choice. 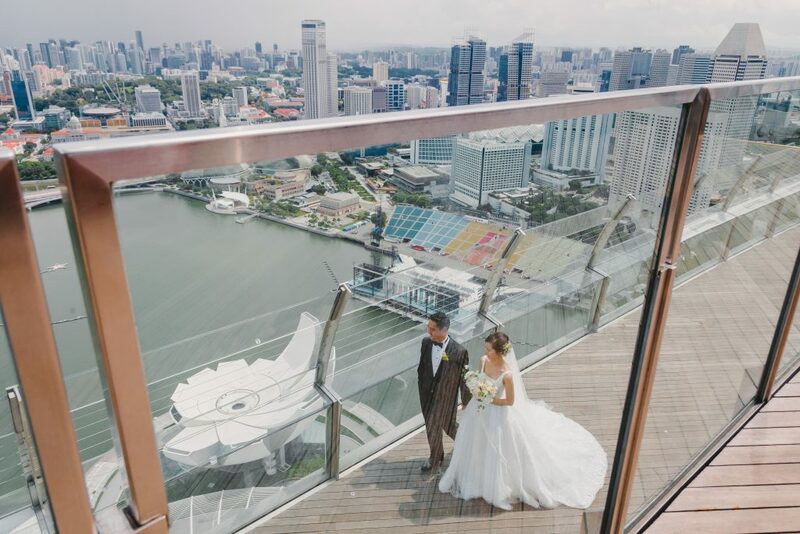 In Singapore, it is common for couples to book their venues 1 year in advance. 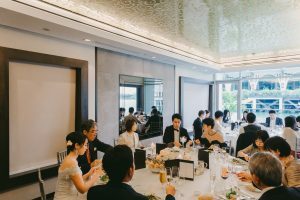 For Japanese couples, the seniors place more emphasis on receiving formal invitation for your wedding. Hence we also recommend to inform your guests about the wedding date as soon as you have confirmed the venue, and to send out your invitation cards at least 2 months prior to the wedding, as a formality and to give your guests ample time to make travel arrangements. 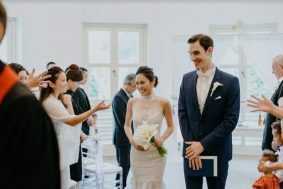 Of course, there are also couples now who use e-invitation given that they think the guests are all families and close friends and formal invitation is unnecessary. 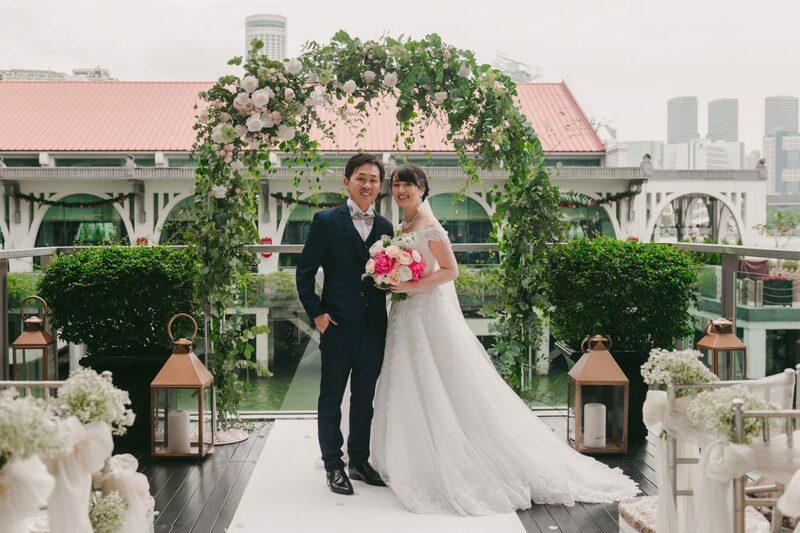 With its beautiful architecture and historic value, this is no doubt the most popular choice of venue for Japanese couples. Most couples hold their ceremony in its beautiful garden lawn, followed by a simple lunch reception in one of its smaller function room. Unfortunately the Hotel has been under renovations since late last year, and it is expected to only open for event bookings only in the last quarter of 2018 or early 2019. Based on their last rates before renovations, ceremony package was $2688++. These pods are located within Fullerton Bay Hotel Singapore, and is popular because of its Marina Bay view. There are 3 pods next to each other, and Port of Call is the most popular as it has the “closest” view of Marina Bay Sands. Ceremony is usually held at the upper deck, and lunch/dinner reception held in the private room below the deck. The capacity of each pod is 24 person seated maximum (2 round tables). However, there is possibility that all 3pods can be having events at the same time, as booking 1 pod does not “block-out” the other 2 pods. Rates are also very reasonable at $118++ per person, with a minimum of 20 person, inclusive of a sit-down/buffet lunch or dinner, or canapés spread. This space is newly opened late last year, catered specially for small weddings. 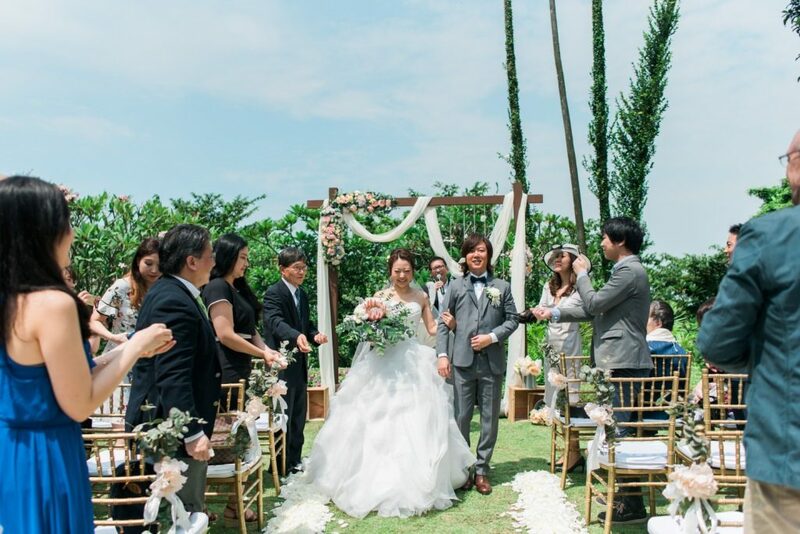 With it being managed by Watabe Weddings, you can expect details that are similar to wedding venues in Japan, which we think is great of course. 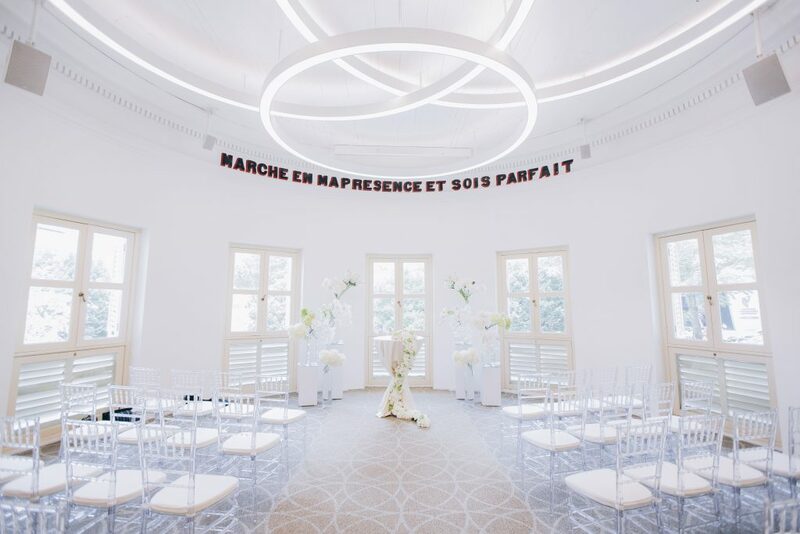 It has a proper preparation bridal room (which most other venues may not have), a reception foyer with a modern interior, and a “church-like” space for ceremony. Ceremony package is around $3988++, with ceremony setup, but note that this does not include any food. 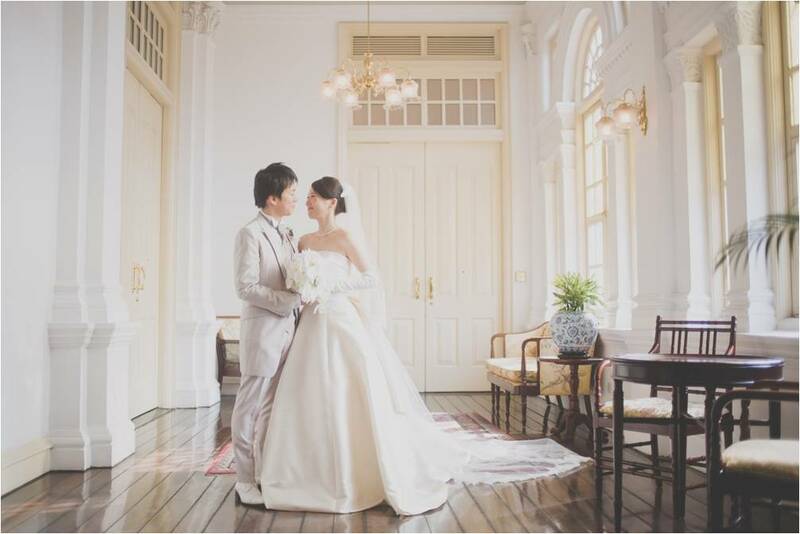 Likewise for Chijmes Hall, it is being managed by Watabe Weddings. 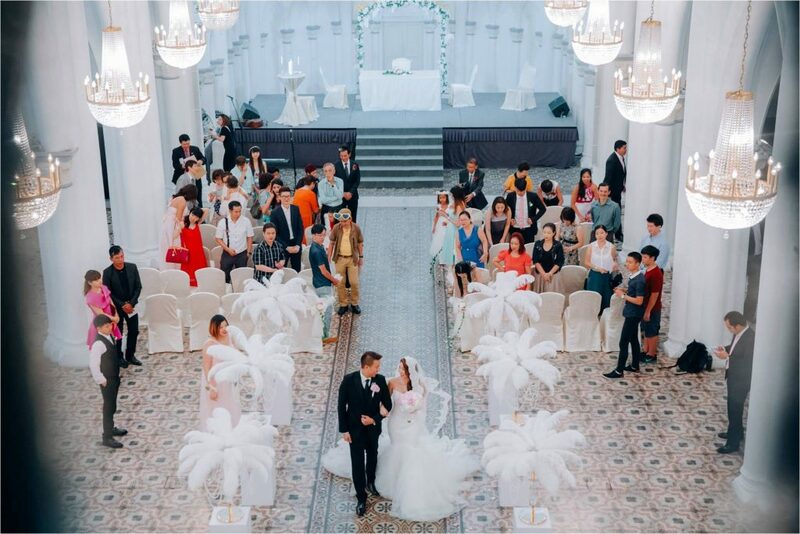 However, as the space here is much bigger than Alcove, on weekends, priority is given for larger weddings (as mentioned Singapore weddings are much bigger and Chijmes Hall can hold up to 300 person). Hence, for small Japanese ceremonies, the venue only accepts Weekday bookings. 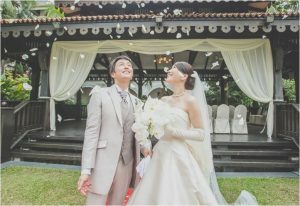 Ceremony package is also around $3988++, and does not include food. 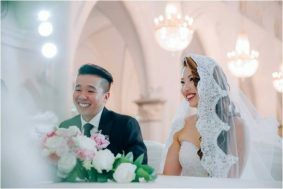 Many Japanese couple likes the Church-like interior, which is similar to wedding ceremony venues in Japan. No Japanese would not know Marina Bay Sands since it got famous from the SMAP commercial! Other than it being so iconic, it boasts a great view from the roof, which guests are usually in awe of. Minimum spending for booking this space is $3000+++ for lunch, while dinner at $18,000+++ to 20,000+++. You are also able to hold a simple reception party after the ceremony. 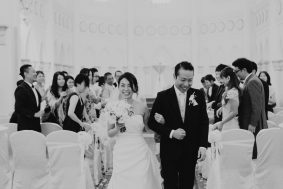 Venues are not limited to the above as we have only picked out some that are popular among Japanese couples for small wedding ceremonies. *All photos above are from events we have organized. 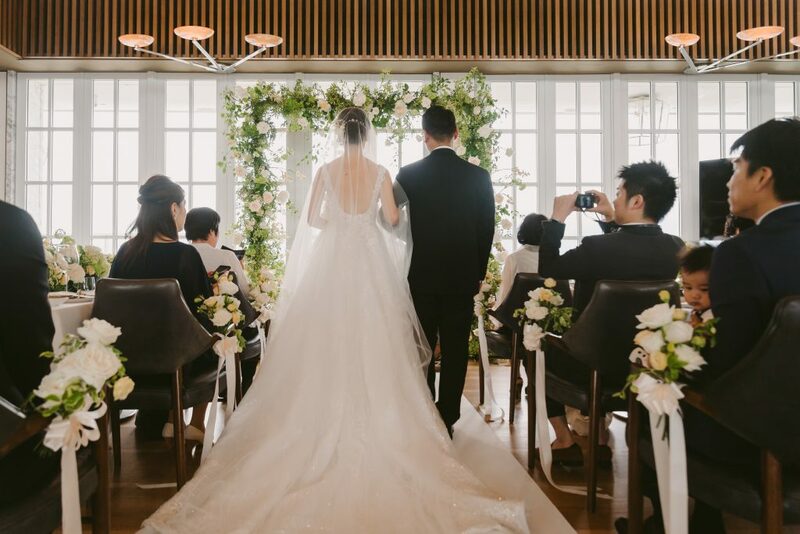 Our style of planning is what Japanese couples known as the “free wedding”, meaning we charge a standard fee for our planning services and all other arrangements are fully customized. Hence, we do not have fixed packages for ceremony. Simply let us know what you like and we will create an original wedding suited to your preferences. Please feel free to find more information on our main page or reach out to us via produce@eternal-emotion.com and we will be happy to answer to any queries you have!